UFO-Forschung - UFO aka Jupiter im Tiefflug beim Mond? Raumfahrt - Ein Team von indischen Ingenieure sind im Rennen um weltweit erstes preiswertes und privat betriebenes Raumschiff zum Mond zu senden. LMU cosmologist Viatcheslav Mukhanov models the first instants after the creation of our Universe. Data from the Planck telescope have now confirmed beyond any reasonable doubt his theory of the quantum origin of structure in the Universe. What exactly happened after the Universe was born? Why did stars, planets and huge galaxies form? These are the questions that concern Viatcheslav Mukhanov, and he tries to find the answers with the help of mathematical physics. Mukhanov, Professor of Physics at LMU, is an acknowledged expert in the field of Theoretical Cosmology – and he has used the notion of so-called quantum fluctuations to construct a theory that provides a precise picture of the crucial initial phase of the evolution of our Universe: For without the minimal variations in energy density that result from the tiny but unavoidable quantum fluctuations, one cannot account for the formation of stars, planets and galaxies that characterize the Universe we observe today. For Mukhanov, the idea that quantum fluctuations must have played a role in the very earliest phase of the history of the Universe is implicit in Heisenberg’s Uncertainty Principle. Heisenberg showed that there is a specific limit to the precision with which the position and the momentum of a particle can be determined at any given moment. This in turn implies that the initial matter distribution will inevitably exhibit minute inhomogeneities in density. Mukhanov’s calculations first demonstrated that such quantum fluctuations could give rise to density differences in the early Universe, which in turn could serve as seeds for the galaxies and their clusters. Indeed, without quantum fluctuations, whose nature and magnitude Mukhanov quantitatively characterized, the observed distribution of matter in the Universe would be inexplicable. The latest study of the Planck datasets is more detailed and more informative than the preliminary analysis published about 2 years ago. 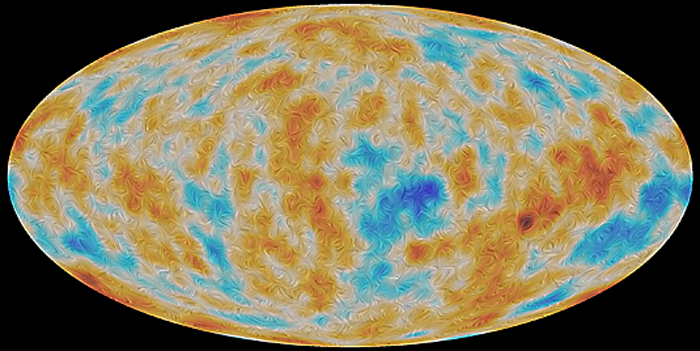 It reveals with unprecedented precision the patterns imprinted by primordial fluctuations on the distribution of radiation in the young Universe. Thus, instruments such as the Planck telescope can record these dispatches from an unimaginably remote past encoded in the microwave radiation that is still propagating through space – 13.8 billion years later. And from this information the Planck team can reconstruct a detailed picture of the distribution of matter at the birth of our Universe. Furthermore, the Planck data show that a previously reported signal purportedly confirming the existence of so-called primordial gravitational waves can be largely attributed to dust in our own galaxy. The BICEP2 team is using a ground-based telescope in the Antarctic to search the CMB for signs of gravity waves produced immediately after the Big Bang. In March 2014, the team reported the detection of the long-sought pattern. However, doubts soon emerged regarding this interpretation. Now a joint analysis by the Planck and BICEP2 teams has concluded that the data do not actually provide observational evidence for gravitational waves. In the spring of 2014 Viatcheslav Mukhanov had already asserted that, if the theory is correct, then the BICEP2 and Planck teams could not both be right. Thus this latest Planck-BICEP2 analysis reassures us that the theoretical framework is well-founded. “Gravitational waves may well be there,” he said then, “but clearly our instruments are not yet sensitive enough to pick them up.” ­– Regardless of whether or not the search for primordial gravitational waves succeeds, he adds, no model that tries to capture the immediate aftermath of the Big Bang can now leave the quantum origin of the Universe’s structure out.